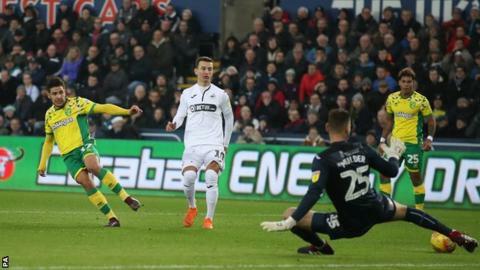 Norwich City head coach Daniel Farke played down his side's title hopes despite a sixth straight Championship win after a clinical performance at Swansea City. The Canaries raced into a 3-0 lead inside 37 minutes, before Daniel James pulled one back, but Teemu Pukki's turn and finish sealed it on the hour mark. "There are many other clubs with much bigger possibilities," Farke said, when asked if his side were favourites to win the league. "We have such a young squad. We're keeping our feet on the ground." He added: "When you are the league leaders, everyone is more greedy to be successful against you. Swansea were highly motivated today but we had a good answer." Swansea's day started badly when Mike van der Hoorn turned the ball in to his own net early on, with Emiliano Buendia slotting in Norwich's second and Marco Stiepermann tapping in to complete a neat third. The hosts, who had won three of their previous four games, briefly threatened a comeback after 21-year-old James' first league goal. But Pukki, who struck Norwich's 97th-minute winner when they beat Millwall 4-3 last time out, made the points safe again when he netted his 14th of the season in all competitions. His goal saw the impressive Canaries score four in a game for a third consecutive match, with Finland's Pukki netting five of those 12 goals. The victory was Norwich's 14th from 22 games in all competitions this season, and their 11th from their past 14. Swans boss Graham Potter called it "an uncomfortable afternoon" and admitted his side had made it too easy for the Championship front-runners. "All credit to Norwich, over the course of the game they deserved to win, they were the better team and attacked and defended well," he said. "But I think we contributed a little bit more to their performance than we would like. "To improve you have to have a bit of suffering and go through setbacks and it's how we respond as a group and as a team. There's no time for us to feel sorry for ourselves." Match ends, Swansea City 1, Norwich City 4. Second Half ends, Swansea City 1, Norwich City 4. Foul by Mario Vrancic (Norwich City). Attempt missed. Martin Olsson (Swansea City) left footed shot from outside the box is close, but misses to the left. Assisted by Barrie McKay. Substitution, Norwich City. Jordan Rhodes replaces Moritz Leitner. Matt Grimes (Swansea City) wins a free kick on the left wing. Foul by Alexander Tettey (Norwich City). Attempt saved. Oliver McBurnie (Swansea City) right footed shot from the left side of the box is saved in the centre of the goal. Assisted by Martin Olsson. Kyle Naughton (Swansea City) wins a free kick in the defensive half. Delay in match Mike van der Hoorn (Swansea City) because of an injury. Delay in match Emiliano Buendía (Norwich City) because of an injury. Substitution, Norwich City. Todd Cantwell replaces Onel Hernández. Corner, Swansea City. Conceded by Onel Hernández. Foul by Barrie McKay (Swansea City). Corner, Swansea City. Conceded by Alexander Tettey. Jamal Lewis (Norwich City) is shown the yellow card for a bad foul. Daniel James (Swansea City) wins a free kick on the right wing. Foul by Jamal Lewis (Norwich City). Offside, Norwich City. Emiliano Buendía tries a through ball, but Marco Stiepermann is caught offside. Attempt saved. Emiliano Buendía (Norwich City) right footed shot from outside the box is saved in the bottom left corner. Corner, Norwich City. Conceded by Joe Rodon. Attempt blocked. Teemu Pukki (Norwich City) right footed shot from outside the box is blocked. Assisted by Onel Hernández. Substitution, Swansea City. Barrie McKay replaces Bersant Celina. Attempt saved. Connor Roberts (Swansea City) right footed shot from the centre of the box is saved in the centre of the goal. Assisted by Wilfried Bony with a through ball. Emiliano Buendía (Norwich City) wins a free kick on the right wing. Corner, Swansea City. Conceded by Maximillian Aarons. Goal! Swansea City 1, Norwich City 4. Teemu Pukki (Norwich City) right footed shot from the centre of the box to the bottom left corner. Assisted by Onel Hernández.